Back in January I took my first trip to Asia where I visited Taiwan and Japan. In Tokyo, we visited the Tsukiji fish market, which is world-famous for both the sheer size of the inner and outer markets and for being the main auction site for the best Tuna in the world. Apparently, for much of the year, a small number of onlookers are permitted into a small room inside the inner market from where they can watch the auction process – fish are unloaded, inspected, and ultimately bid up to thousands of dollars. Unfortunately, for the new year’s season when we were in Japan (as well as some other tourist-induced occasions as mentioned on the Okonomiyaki Blog) the auction is completely closed to outside viewing. It’s not that the rest of the market isn’t interesting — even if you are lazy and sleep late you will find plenty of interesting specimens in the inner market where seafood is traded whole and in pieces. Imagine how they must punish thieves! The outer market and the whole neighborhood around Tsukiji offer up interesting fare — ranging from fresh sushi to beautiful kitchen and market utensils. While I had a great experience visiting Tsukiji, we went multiple times on our trip, it was unclear to us whether we could even have gone to the auction had it not been during the super-busy holiday season when they bar viewers to ensure smooth operations. The prospect of getting to the market by 5am was challenging given the train schedules, forget the fact that we would have had to wake up at 3am. Since we don’t speak or read Japanese we were at a bit of a loss for official information, but it seemed that the fate of visitors remained somewhat precarious after the earlier incident mentioned above. Keep in mind, though, that we visited Japan in January of 2011. All of this changed after the Tohoku earthquake in March. At that point the Market barred all visitors. Now, according to news reports and the Life To Reset blog, the auction is open and accepts 120 viewers per day. Much like us, the author of that blog ran into some challenges making it to the market before 5am, but it seems she enjoyed the inner market as her pictures attest. I wonder, though, whether things are different now after the earthquake and the nuclear reactor disaster. Are there less tourists? Are people more concerned about eating seafood that might have been caught in contaminated waters? I was just in Japan earlier this year so it’s not a pressing question for me as I’m not a potential near-term visitor, but I am sure it is on the minds of many. This entry was posted in Travel and tagged Japan, Tokyo, Travel, Tsukiji Fish Market. Bookmark the permalink. 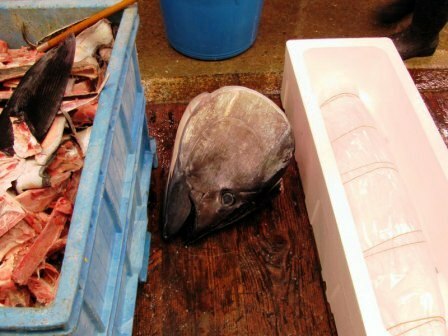 1 Response to Tsukiji Auction Reopens? hey wrong sox, thanks for mentioning my blog on your post..
the auction was closed after the great earthquake and just recently opened like two weeks ago. still there are eager tourist like us who tried to see it but failed. life in japan is getting back to normal and i been seeing more and more tourist every weekend on the usual spots.